Climate Corporation, which crunches weather data to model agricultural crop risks and yields, is not the average Silicon Valley technology company. And now it has been bought by not-at-all-the-average Silicon Valley acquirer — the massive and controversial agriculture giant Monsanto, in a $930 million cash deal aimed at using big data to improve farming yields. The deal is one of the best and most lucrative examples so far of applying a Google-style data-science mind-set to an existing industry — in this case, the world’s oldest and most popular: Farming. Despite its focus on agriculture, Climate Corporation was very much a prototypical Silicon Valley startup. Founded in 2006 under the name WeatherBill, it had raised $110 million in total from investors including Founders Fund, Khosla Ventures, Google Ventures, NEA, Index Ventures, Atomico, Glynn Capital and Western Technology Investment. It was founded by ex-Googlers: CEO David Friedberg was previously a member of Google’s corporate development team, while CTO Siraj Khaliq led technical projects such as Google’s distributed-computing infrastructure, and Google was the largest former employer for the startup. Climate Corporation had built a network of insurance sellers for both crop insurance and weather insurance, and offered Web and mobile tools for farmers so they could make decisions about how to do their work. It has thousands of customers with many millions of acres in the U.S.
Shares of Monsanto were trading down about one percent this morning, at $103.73, having dropped after the company missed its quarterly earnings expectations with a loss of 47 cents per share. 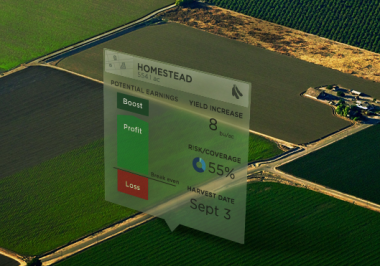 “We recognize that data is just another commodity, but the decisions you can make from that data affect every aspect of the farm,” Friedberg said. He added that Climate Corporation will continue operating as it does under its new owner, and plans to announce a paid version of its weather-information products in about a month. When Neil Rimer of Index Ventures first invested a $300,000 convertible note with Friedberg, the company hadn’t yet figured out what industry it would serve, he said in an interview this morning. At first, Climate Corporation tried insuring film productions, travel bookings and major events like the tennis U.S. Open against bad weather. “Then we realized that the big monolithic iceberg of market was agriculture,” Rimer said. Other examples of that big-data approach could include LendingClub in financial services, Palantir in security and Uber in transportation.